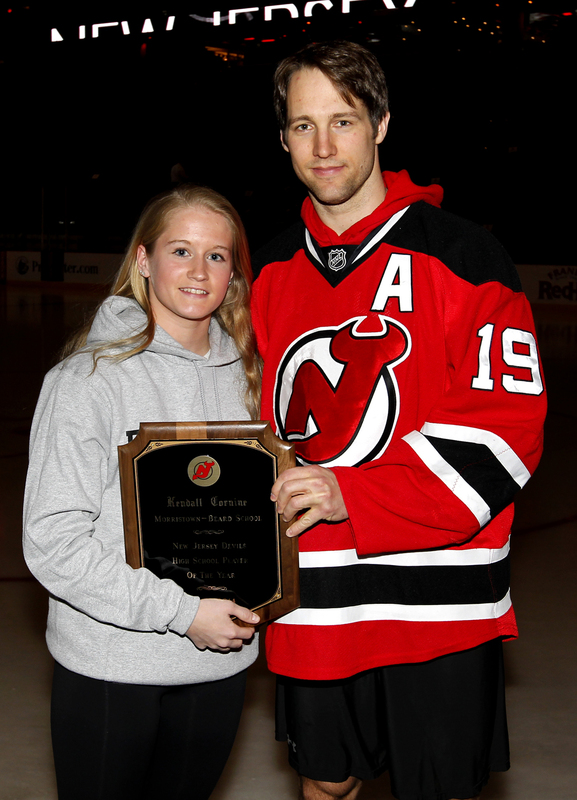 Congratulations to MBS junior Kendall Cornine ’15, who was recently honored by the New Jersey Devils’ as their High School Ice Hockey Girls’ Player of the Year. Cornine was honored at the Devils’ final home game of the season against the Boston Bruins with a plaque presented by center Travis Zajac. She also enjoyed lunch and tickets to the game. Cornine, a forward for the MBS girls’ varsity ice hockey team, was the team leader in goals (26), assists (24) and points (50) this year. She tallied four shorthanded goals while finishing plus-32. She helped lead Morristown-Beard School to its fifth consecutive Women’s Interscholastic Ice Hockey League of the Mid-Atlantic (WIHLMA) title this season, as she scored the decisive goal in a 2-0 win over Portledge. In December, she eclipsed the 100-point plateau as her three-goal, three-assist effort led the Crimson to a 9-1 rout of Holton Arms. Cornine was also named a Star-Ledger All-State selection for 2013-14.